North Devon duo Nick Wyke & Becki Driscoll share a love of traditional English fiddle music and also compose their own tunes. We are delighted to be welcoming Paul Sartin (Belshazzar’s Feast, Faustus, Bellowhead) to join them as our guest tutor for 2019! Workshops include technique, expression and repertoire (using our extensive folk library) and there will be plenty of time to play together and receive some individual help. 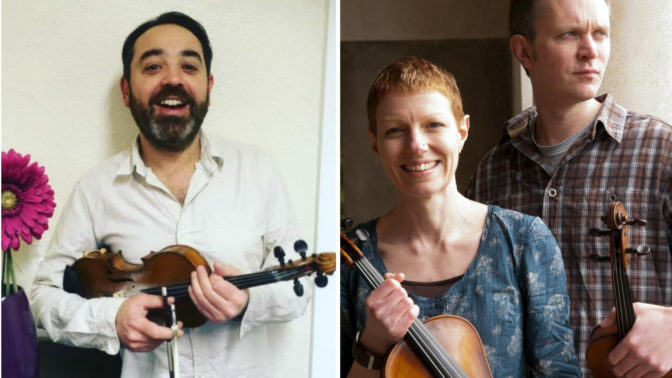 This is an intensive weekend of workshops for fiddle players of all ages who can play folk dance tunes up to tempo either from the music provided, or by ear. Some music will be supplied in advance. Other tunes will be chosen at the event in response to participants’ requests – a Saturday afternoon ‘Open Space’ session offers a chance for workshops on areas requested by course participants, and for individual tuition. On Saturday evening there’s a chance to watch the tutors in action in a public performance at 8pm. Course ends around 5pm Sunday. An intensive weekend for fiddle players of all ages and abilities – with the exception of complete beginners. You’ll need a basic grasp of your instrument and to be able to play either from the music provided or to pick up tunes quickly by ear. Nick Wyke & Becki Driscoll first collaborated on a busking trip around Spain and Portugal. Since then, they have made a strong impact on the British folk scene and received national and international acclaim. The duo’s compositions and their interpretations of traditional English tunes and songs are influenced by a wide range of musical cultures: “We are inspired by the people we meet and the places we’ve been.” Their style is unique; Becki’s melodic, emotive violin and viola blends with Nick’s driving fiddle chords and powerful vocals to create a rich, captivating sound. As well as performing, Nick & Becki’s work varies from recording symphonic string arrangements for the Angel Brothers to running community group ‘The Folk Orchestra of North Devon’ for Wren Music. Paul Sartin: A singer, oboist, violinist, composer and arranger, Paul was member of multi-award winning Bellowhead; and continues to work in BBC Folk Award-nominated ensembles Belshazzar’s Feast, and Faustus, recipients of the German Critics Award. Paul is Director of the Andover Museum Loft Singers, and has 25 years’ experience of teaching, as a peripatetic, at university level, and as workshop and course facilitator for TAPS, Halsway Manor, Aldeburgh Music, EFDSS, Stones Barn, the National Youth Orchestra, and at numerous festivals. Co-editor of ‘Hampshire Dance Tunes’ (Hobgoblin), he has a particular interest in dance melodies of the south, and in fiddle-singing.